There is a Pattern called Rate limiter in the command INCR page, what is Redis ability to be a counter limit the rate an operation can be performed. It remembers each IP’s requests per second, only able to hit 10 times. It will work perfectly OK in general cases, however might be invalid on heavy traffic system/API or protected from attack. Think about when the request count haven’t over the quota, if huge of requests visit now at the same time, most/many of those may cross the validation. The time window exists between after the checking and updating the counter. The case is similar to Double-checked locking from Singleton Design Pattern, the difference is it requires distributed lock in our case here. 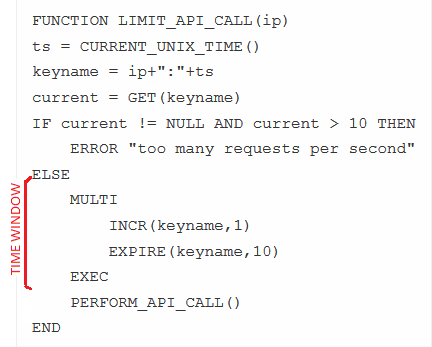 static String SCRIPT_LIMIT_PER_PERIOD = ""
+ "local current = tonumber(redis.call(\"get\", KEYS)) \n"
+ "if (current ~= nil and current >= tonumber(ARGV)) then \n"
+ "	error(\"too many requests\") \n"
+ "local result = redis.call(\"incr\", KEYS) \n"
+ "redis.call(\"expire\", KEYS, tonumber(ARGV)) \n"
The followed additional 5 requests are successful blocked. Expire can be extends automatically if checked key doesn’t contains timestamp. Every time allowed a request will reset expire again, the whole timeout is not accurate. If timeout is a large value, the expired key can be removed by Redis automatically at a very late time. This maybe a concern for huge unique visitors system. The advanced version firstly check and set the key only if not exists, this will fix the reset timeout issue. Note that in the middle, it still have a check whether key is exist, which for key can be just expire at that time in technically. Redis 4.0 (currently in Beta) will introduce a new feature Module, a add-ons to extend write use cases in native scope. Currently there is already have one for rate limiter implementation at brandur/redis-cell, which you can keep eye on it.